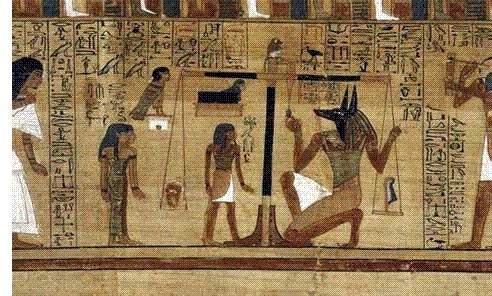 Egyptian Book of the Dead - The Egyptians were very thorough about preparing their dead for the afterlife. The body was mummified to prevent decay and, depending on the individual's status in this life, buried with those items necessary to more easily pass through to the next. Food and weapons were standard, while members of royalty often had servants sacrificed and buried with them. Some Egyptians were even buried with a boat. The Duat (underworld) was separated from this world by a great watery abyss and a boat would make it safer to cross into the Duat. And starting with the New Kingdom, another tool was added to make the journey easier. The Egyptians called it the "Book of Coming Forth by Day." It was a funerary text consisting of spells, prayers and incantations meant to supernaturally prepare a person for entry into the Duat. Initially, the texts were inscribed on the sarcophagus, but eventually, they were written on papyrus and buried with the body. A German Egyptologist named Karl Richard Lepsius translated and published the first of these texts and dubbed them, "Book of the Dead". The earliest date to about the middle of the 16th century BC. Funerary texts are much older than these; in earlier times they were called Pyramid Texts and Coffin Texts. But by the New Kingdom, they were replaced by the Book of the Dead. There is no standard complete version; there are, however, standard individual spells. Each person appears to have chosen which ones to take with them. One of the most famous books ever discovered is called the Papyrus of Ani, so-named because it was found in the tomb of a scribe named Ani. One of the sections is called "Pylons of the House of Osiris". If a person entered the House of Osiris in the underworld, he would soon discover that the house was protected by a number of guardians marked by a pylon. Upon approaching, the person would have to know the guardian's name in order to pass. The "Pylons of the House of Osiris" lists the name of each guardian.